Marrying the obsolete but reliable chassis of the Czech-built Pz 38(t) tank and the captured Soviet 76.2mm PaK 36(r) L/51 anti-tank gun, the Marder (Marten) provided the Wehrmacht with a potent self-propelled gun. These captured Soviet weapons were rechambered to accept German 75mm PaK 40 ammunition and avoid supply issues. As the war progressed, the main guns were replaced with the PaK 40 anti-tank guns. 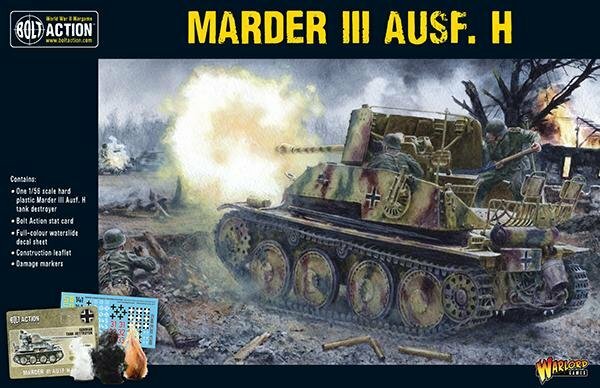 Deployed on both the Western and Eastern fronts, the Marder III also saw action in North Africa where it was one of the few German options to counter the heavily armoured British Matilda infantry tanks. In all, 1,581 Marder III tank destroyers were produced and would continue to be employed to the war’s end in 1945.